Should Renewable Energy Sources (RES) auction systems support development of a wide range of different technologies or instead focus on supporting a select few? We review some of the approaches to RES technologies differentiation in relation to RES auction designs. 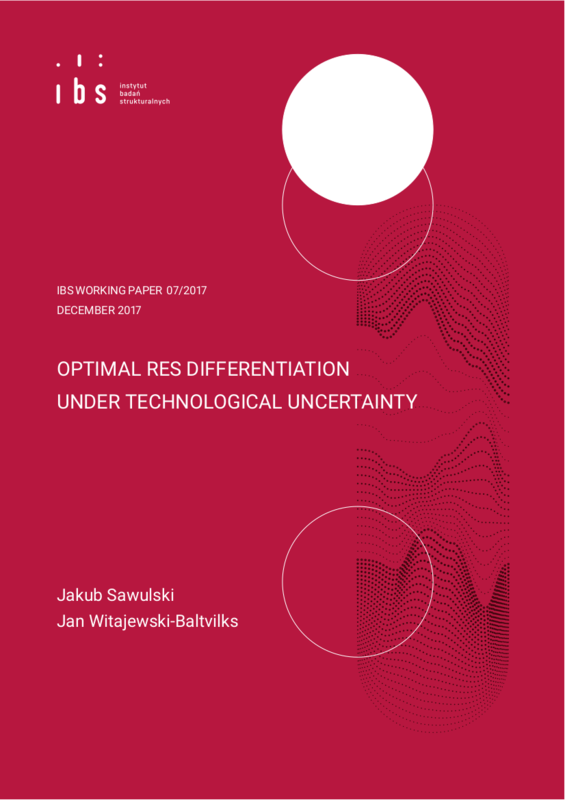 Subsequently, we use an analytical model to examine the optimal differentiation of RES technologies when the future costs of RES installations are subject to uncertainty. We allow uncertainty to influence the cost function in two ways: (i) as an uncertain magnitude of the learning-by-doing effect and (ii) as a possibility for an exogenous random technological shock (such as an unexpected technological breakthrough). We find that uncertainty of learning rates increases the benefits of differentiation. This result, among other things, implies that optimal differentiation predicted by the energy models that assume fixed learning rates is biased downward. On the other hand, where exogenous shocks are present the differences between the costs of technologies are large and the planner has less incentive to commit to support a diversified pool of technologies and more incentive to favour the choice of a technology which is cheapest at the given moment in time. This last result is more pronounced when there is no learning-by-doing effect. We recommend that countries with potentially large learning rate effects - such as those countries at the technological frontier - should increase differentiation, while more peripheral countries should limit differentiation. additional information: We thank Marek Antosiewicz for his comments. The research leading to these results has received funding from the European Union Horizon2020 under Grant Agreement No. 642260. The usual disclaimers apply. All errors are our own.